I just got the new Saveur issue the other day and it was all about Greek cuisine. This inspired me to make my own little Greek dinner last night. Since Yuki mentioned that I haven’t made pork tenderloin in a while and it was great weather to grill I put 2 and 2 together and came up with a delicious meal. I got a beautiful 1.3 pound tenderloin. To marinade it I mixed together 1/4 cup of olive oil, 1/4 cup of red wine, the juice from 1/2 lemon, 1 tablespoon of dried oregano, 4 garlic cloves minced and mashed into a paste, 1 bay leaf that I crumbled, and a decent amount of black pepper. I let it marinate in the fridge for about 3 hours and then at room temperature for another 2 hours. Every hour or so I flipped it around so that the marinade would penetrate evenly. I made some spanakopita for a side. I melted 1 tablespoon of butter in a pan, sautéed 1/2 diced onion for about 6 minutes, then wilted down a 5 ounce package of baby spinach. I put that in a bowl, let it cool, then seasoned it with salt and pepper, 1/4 teaspoon of ground nutmeg, and 4 ounces of feta cheese. Instead of the usual triangles I decided to make them into cigars. 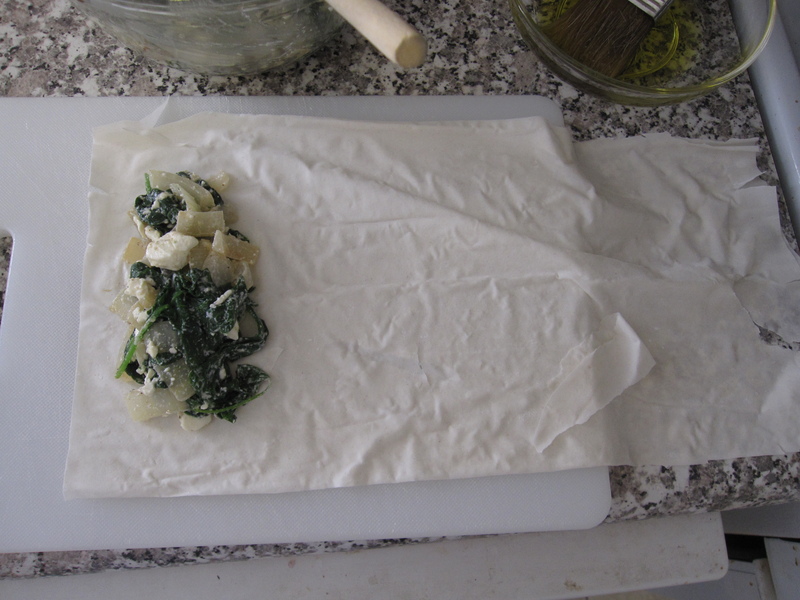 I cut some phyllo dough into about 5.5-6 inch strips. At one end I placed some of the spinach mix. 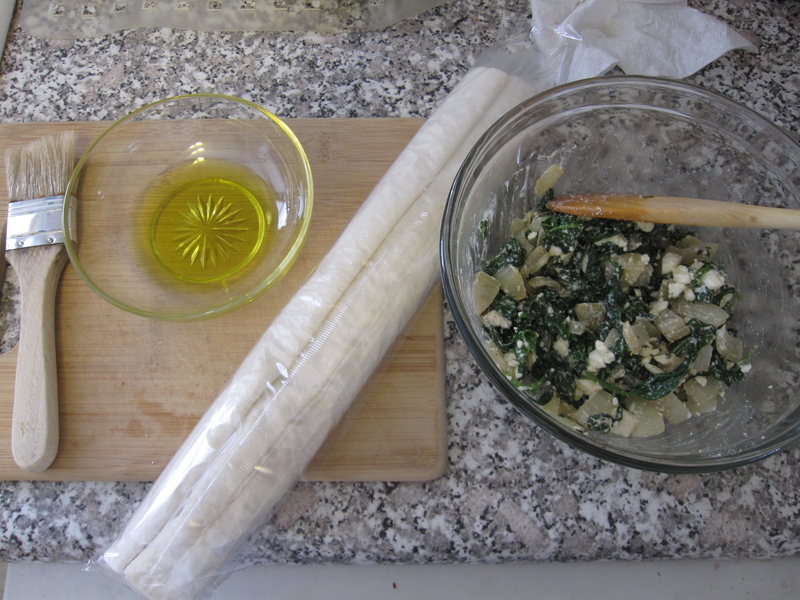 Then I folded in the edges, rolled them up, and brushed them with olive oil. I got 5 cigars out of them. So I guess you can figure about 1 ounce of spinach for each one. I put them in a 375 degree oven for about 20-25 minutes. They burst open a little while cooking, I must have rolled them a little too tight. I guess I’m used to rolling other things. If you make these, don’t make them too tight. 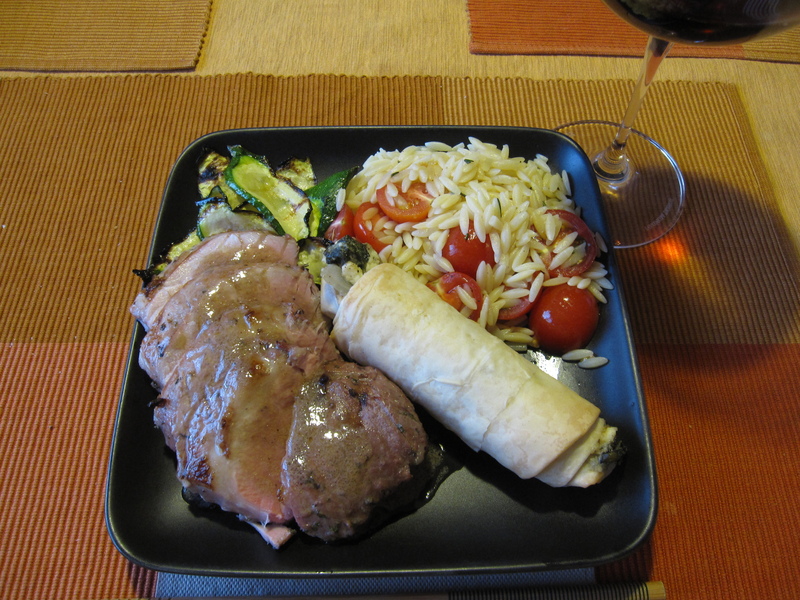 While the spanakopita was cooking I grilled up the tenderloin along with a zucchini that I thinly sliced. 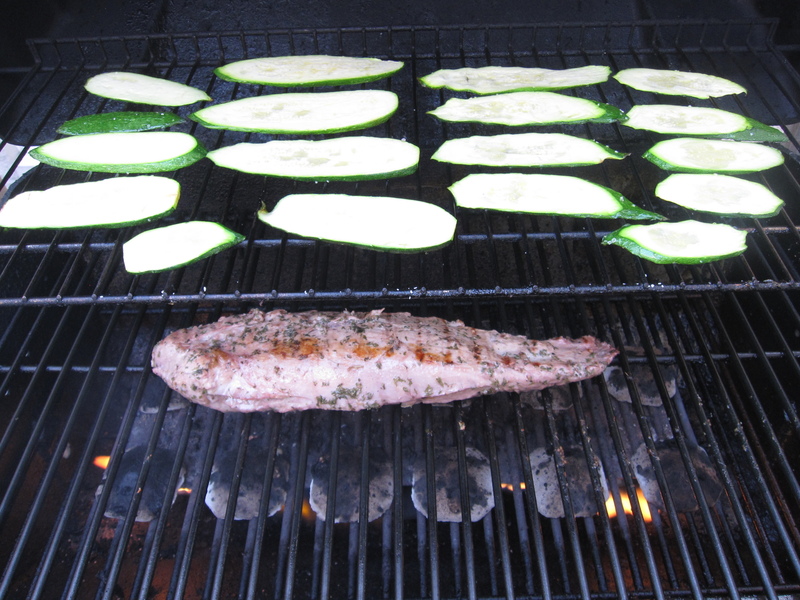 I brushed the zucchini with olive oil prior to grilling. I did it over a medium heat for about 10 minutes on each side. 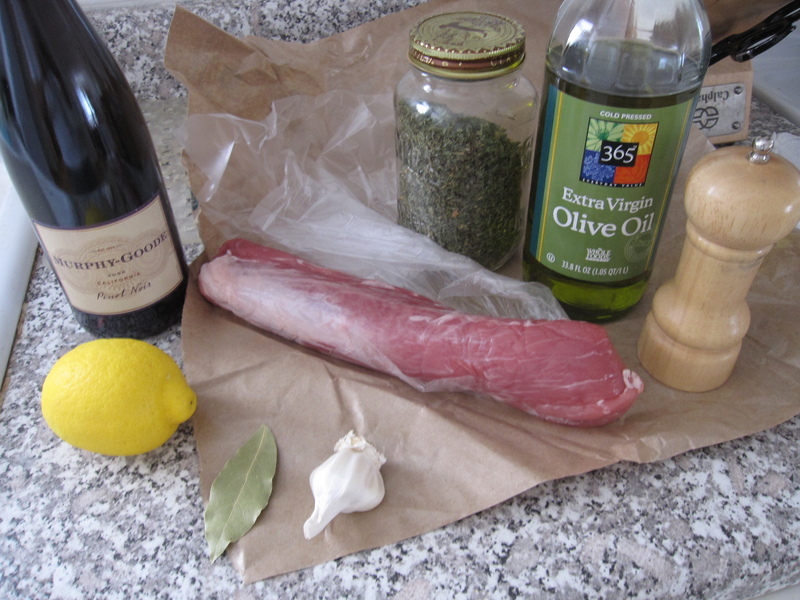 I don’t like cooking tenderloin all the way through like a chop, that kills the soft texture. If you have a good fresh piece of meat there should be no worry about trichinosis with a tenderloin as there isn’t much fat for the little buggers to hide in. Also, drinking alcohol helps (it helps a lot of things!). Oh, I also sprinkled some salt on both sides of the tenderloin before grilling as well. I don’t like salting marinades because that draws the moisture out of the meat. It’s best to salt just before cooking. While the meat was grilling I boiled down the marinade to make a quick sauce. I also made some orzo with cherry tomatoes and rosemary. I simply boiled 3/4 cup of orzo in salted water according to package instructions. After draining it, I tossed it in a bowl with a handful of halved cherry tomatoes and one sprig of rosemary that was given the once-over with my knife. A little salt, pepper, and olive oil and my starch was good to go. Last thing, I let the meat rest for 10 minutes before slicing it. That gave it time for the juice to chill out and redistribute. If meat doesn’t rest after cooking the juice will run out and your meat will go dry. No one wants dry meat. A little juice goes a long way! PS- This came out to 3 portions instead of my usual 4. I had lunch plans today, so I didn’t need lunch for myself.